The Infinity Gauntlet is a six-issue comic book limited series published by Marvel Comics from July to December in 1991. The series was written by Jim Starlin and penciled by George P�rez and Ron Lim. Thanos mounts the six Infinity Gems (collected in the Thanos Quest limited series) on his left glove to form the titular Infinity Gauntlet. Each Gem grants its bearer complete mastery over one aspect of the multiverse: Time, Space, Mind, Soul, Reality, and Power. 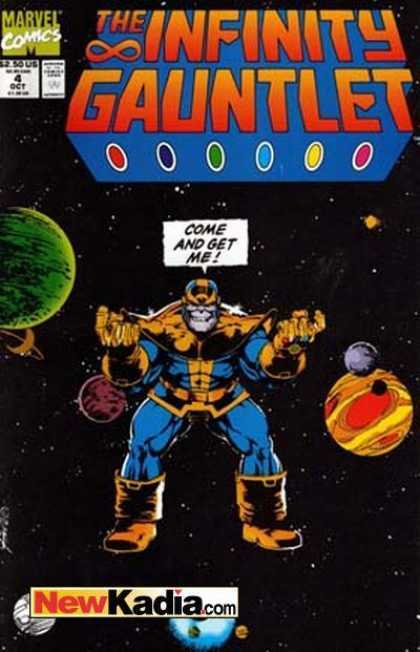 Now all-powerful and desperate to win the affections of Death, Thanos decides to offer the entity a gift of love by completing a task she had given him, erasing half the sentient life in the universe (including most of the X-Men, Daredevil, and the Fantastic Four), quite literally with a snap of his fingers. The surviving heroes on Earth band together�guided by the newly-resurrected Adam Warlock�to battle Thanos. In a bid to impress Death, Thanos allows the heroes a slight chance of winning, but easily defeats and kills almost all of them. Thanos then goes on to defeat and imprison many of the universe's cosmic entities�including Galactus; the Stranger; the Titan Kronos; Epoch; the entities Love and Hate; two Celestials; Master Order and Lord Chaos; and Eternity. After defeating Eternity, Thanos leaves his body and becomes the living embodiment of the universe. This leaves his abandoned body vulnerable to Nebula, his alleged granddaughter. Nebula takes the Gauntlet off Thanos's hand and dons it herself; she then undoes all of Thanos' actions, restoring her from disfigurement, bringing the dead back to life, and reversing the damage done to the cosmos. Another battle with the heroes and cosmic deities ends with Adam Warlock taking possession of the Gauntlet, after which Thanos appears to commit suicide. Warlock's allies object when he plans to keep the gauntlet intact for himself, but he ignores them. Later, Warlock and his companions discover Thanos working at a farm while contemplating his loss and, satisfied that he is no longer a threat, decide to leave him be.